Southern Maryland is SO beautiful this time of year. Honestly, Fall and Spring are our favorite seasons for sessions because our hometown is just so beautiful and full of color! It was a no-brainer that Kristen and Craig would choose to have a Woodlawn Estate engagement session because this venue is so stunning!! They also wanted to make sure that they had a bit of variety with their engagement session because their wedding is going to be in ARUBA!! Can you say AMAZING?! We LOVE our destination weddings!! We feel like we REALLY get to bond with our destination couples the most because we essentially go on a trip together and everyone knows that trips make friends. Kristen & Craig met officially at his brother’s wedding in Nags Head! Kristen went with a group of friends to Nags Head and was invited to their friend’s wedding. Craig says that when he saw Kristen in her blue dress, his jaw dropped and couldn’t take his eyes off of her!! After the reception, everyone came back to their beach house and the two of them sat outside and talked the night away. Although at the time Kristen was taken, Craig was VERY respectful and just made friendly conversation. 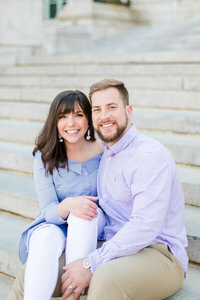 They remained acquaintances until a few years later when they reconnected through mutual friends and Craig was determined to date Kristen! The rest is clearly history because here they are now – ENGAGED!! Kristen volunteered to host a cook out birthday celebration for a good friend at their house on August 5th. The week before, her friend said she did not want to burden Kristen with a cookout (even though Kristen totally volunteered to be the host!) and wanted to cancel. Kristen gave her friend a little attitude because she had started planning and getting things ready for the party! She was ready to party! Since Craig knew Kristen was upset, he told her he made them dinner reservations in Old Towne and that they would just have a much needed date night alone. When they got home from dinner, Craig walked Kristen out to their deck that was lit with TONS of candles and twinkle lights! There were even champagne and roses set up! Kristen’s daughter, Brynleigh, was standing there, along with her best girlfriends and their moms were in our yard holding candles. Then, Craig got down on one knee and proposed to Kristen AND Brynleigh! What a gentleman!! Of course, she said yes and all of their friends joined them to celebrate. Turns out, Craig had asked to move the cookout so he could propose and all of their amazing friends were in on it! It was so perfect and to make it even more special, it was all planned in the new home that they had bought together! We can not WAIT for these two to exchange vows with their friends and family in Aruba next year!! Here are a few of our favorites from this gorgeous engagement session! To browse more fall engagement sessions, click through the links below!